Well, given the previous post about Red Pack tomatoes, I knew some pizza sauce was in order. This is one of the best pizza sauces ever. It's simple: whole peeled tomatoes, fresh minced garlic, oregano, red wine vinegar, quality olive oil and salt & pepper (I also added some garlic powder for some extra umph! Recipe below.) 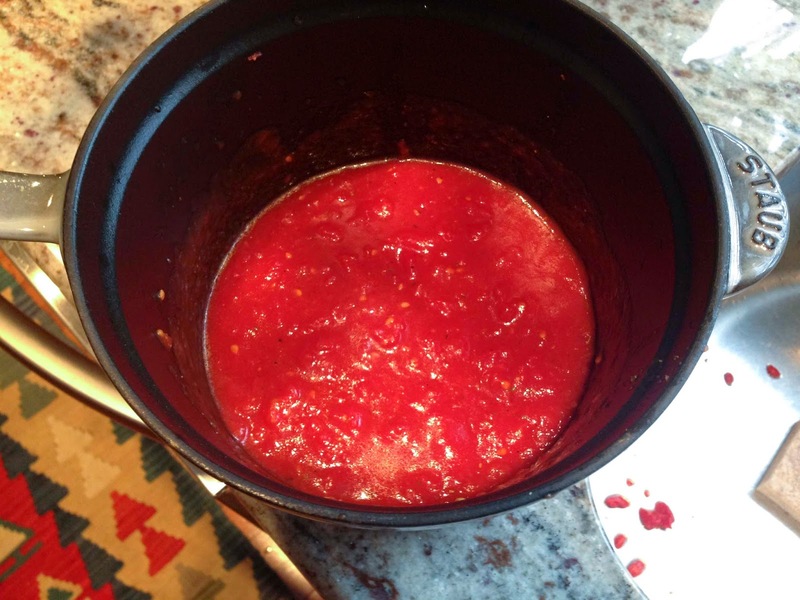 It's also uncooked because when your Big Green Egg hits temps of 700-800, it's plenty hot to 'cook' the sauce; this keeps it tangy, sweet and bright. In addition, some homemade pizza dough was necessary. It is really not as onerous as you would think, in fact, if you have a Kitchen Aid mixer, the process is pretty damn easy. Three important pieces to this are using at least OO flour (very fine) letting the dough sufficiently rise so that it is not too elastic, and stretching it out THIN. 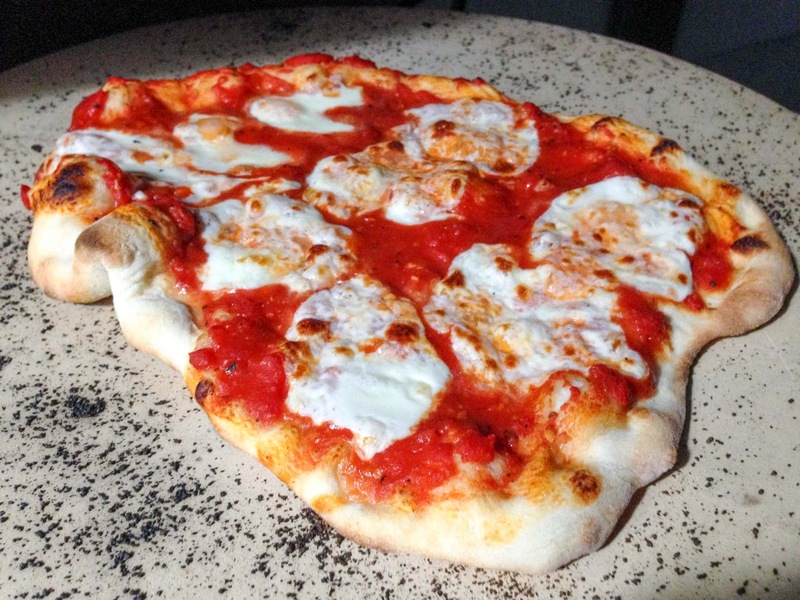 I love thin crust pizza, and it took me two pies to get the method down for cracker thin crust (it had been a WHILE since I had made pizza at home. Recipe also below). Oh, two more tips. 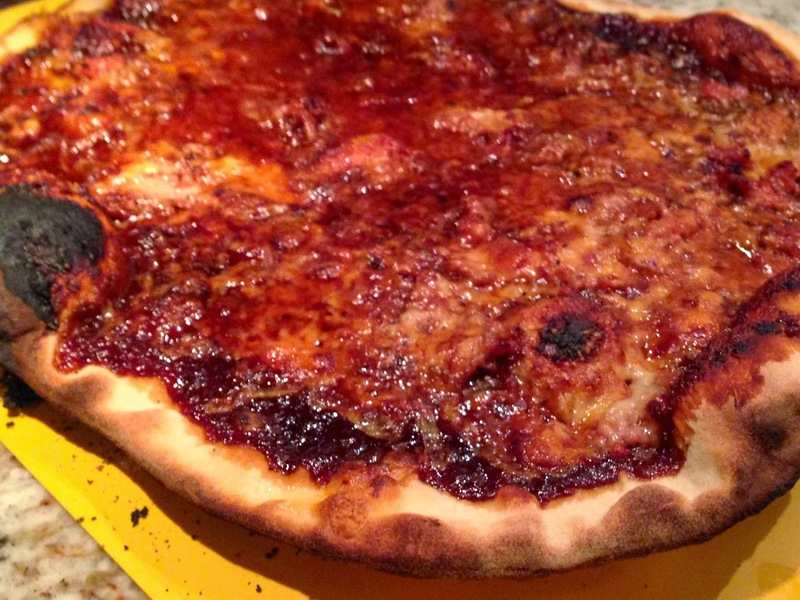 I used a pizza peel covered in cornmeal to set the pies up, and then slid them into an 800 degree Big Green Egg! When using an Egg, the longer you leave the lid open, the cooler you are going to go. This is exponentially magnified when it is in the teens (as it was when I was making these pizzas). Twenty seconds with the lid open and the dome temp was down 150 degrees. 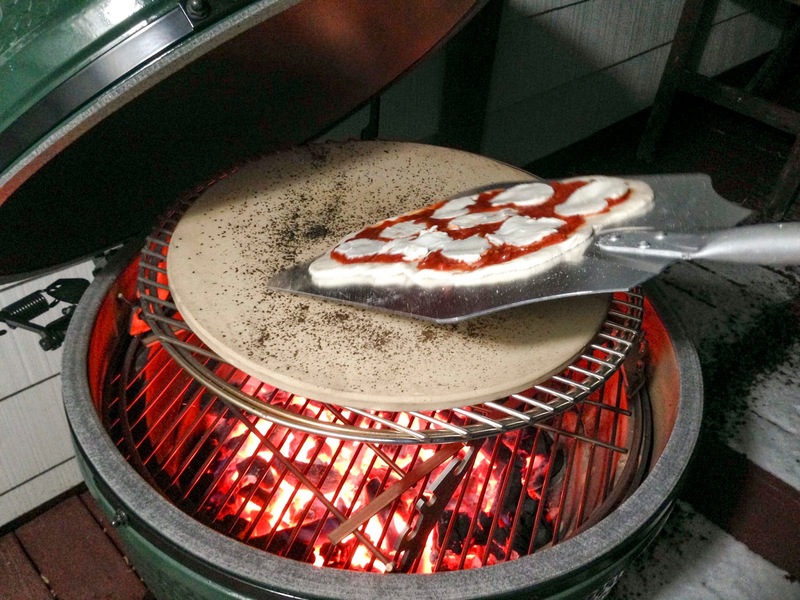 You want to make sure your stone is hot, rather than just the Egg/grill/oven. I let it heat for at least an hour prior to pizza time. 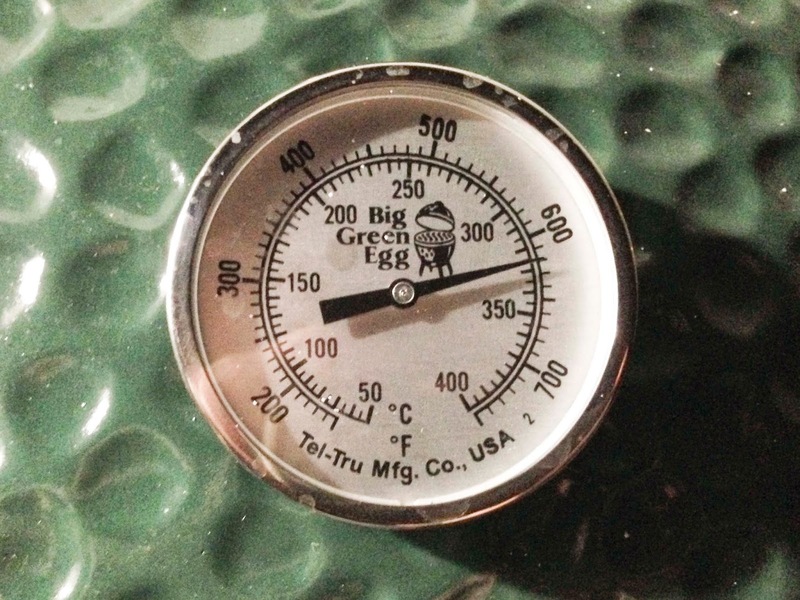 I am a newbie to the BGE, but I can't recommend it enough. It's expensive, but it's so much fun. The range of temperatures is mind boggling. My first effort below. They started getting thinner after this one - admittedly, I was in a rush to get my pizza party started. Look at how the cheese started to brown. 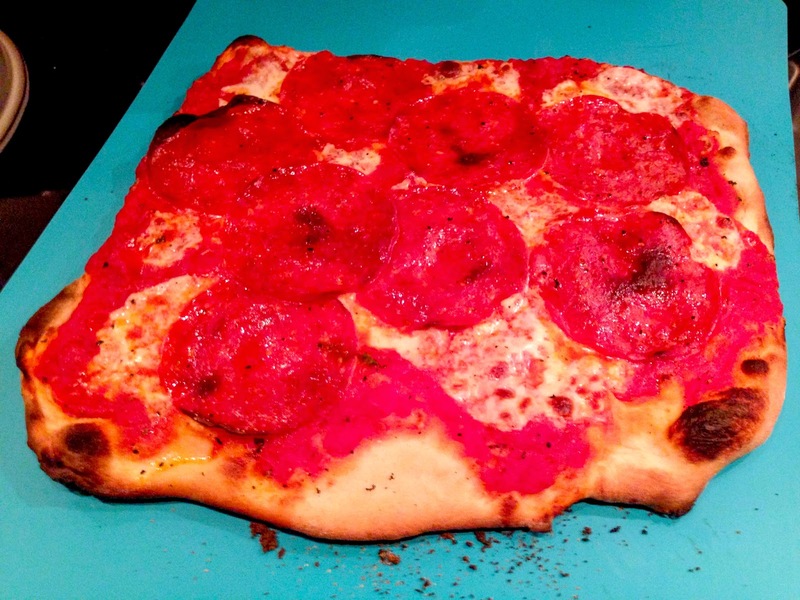 This was the worst pizza of the four I made and it was better than 99% of the pizza I have eaten in my life. Which is a boatload of pizza. The second pizza got better through the incorporation of spicy meats. This version incorporated previously made meatloaf (also smoked to perfection on the egg), and featured BBQ sauce and cheddar. Incredible. The char on the bottom is perfect. Each pizza cooked in a couple minutes. I can't wait to have some pizza parties. Now if I only had friends. I was following a recipe that called for one can of tomatoes, but it didn't say to dump out the liquid, so I went all-in with the entire contents and added a can of tomato paste later to thicken the juicy sauce and I couldn't have been more pleased with the result. So I'm telling you here my exact method. Dump the 28oz can of tomatoes with juice and the minced garlic into a medium stock pot (not because you'll be cooking it, but because the high walls will help reduce splash action in the next step). Using a potato masher, smash the tomatoes until they're pulverized and broken into bite size chunks that suit your fancy. Do not use any sharp blades or machines to do this step because you do not want to break the seeds open - the broken seeds will just add unwanted bitterness to your sweet and tangy sauce. Once you have a good crush going, add the remaining ingredients and mix well with the potato masher, again, just combine everything and don't get too aggressive. Make sure your tomato paste is amply dissolved and you're done! Set it aside until you're ready to spoon it onto your crust. Mix all ingredients in a stand mixer, slowly for 2 minutes, faster for 5 minutes and then slowly again for 2 minutes. Remove bowl from stand and form dough into loose ball and cover with Saran wrap and set in a warm area to let it rise for about 1.5-2 hours; punch it down and push any air bubbles out. 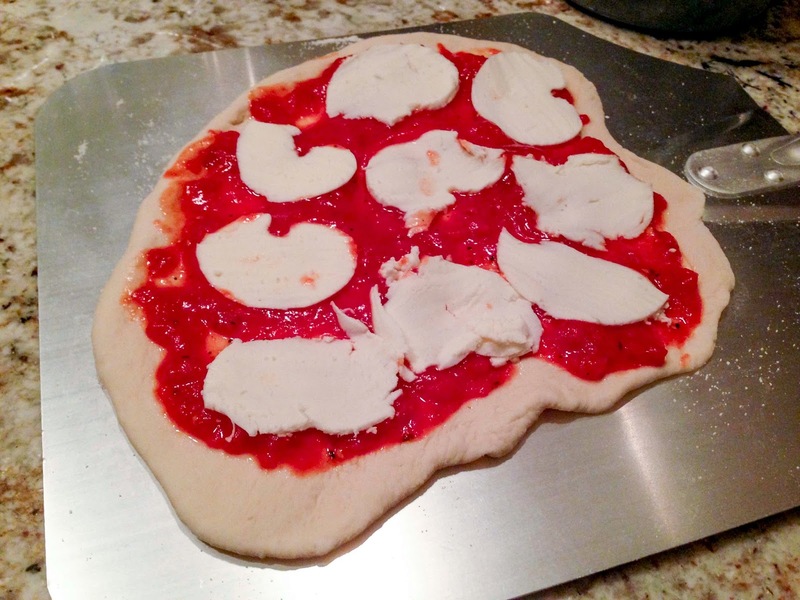 Form the dough into a loose ball again and cut into four equal pieces. If you want bigger pies or a thicker crust, do three equal pieces. Form each of those pieces into balls with a smooth top and seam-side down, set them on a baking sheet and dust the tops lightly with flour; cover with the Saran wrap (this prevents them from drying out, you want them to stay moist until you're ready to roll out your crusts) and let them rest for another 45 minutes to an hour. This is important because the balls will become soft and elastic, allowing you the thinnest crustabilities. On a lightly floured surface. 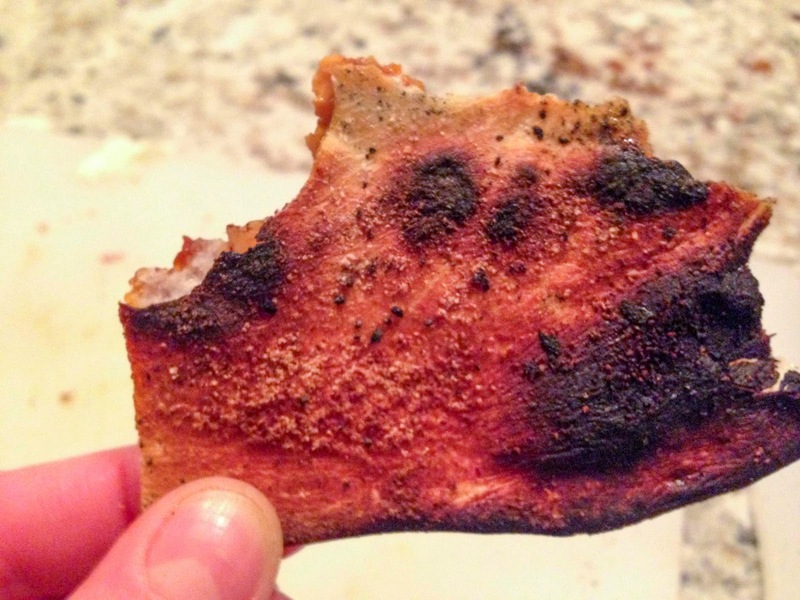 On a pizza stone in a 500 degree oven if you don't have a grill. Your ideal temp is 700-800, so if you have a grill and a stone, try that to get even hotter. You want your stone to be piping hot before sliding the pie on - put cornmeal down on the stone and put it on your pizza peal - or if you don't have a peal, use the bottom of a baking sheet as your prep surface and slide your pie easily off it into the oven. Keep an eye on it. You'll know when it's ready. This looks INCREDIBLE! I'm out in Thailand right now where ovens are practically non-existent, so it'll have to wait until I return home this summer to try this out. 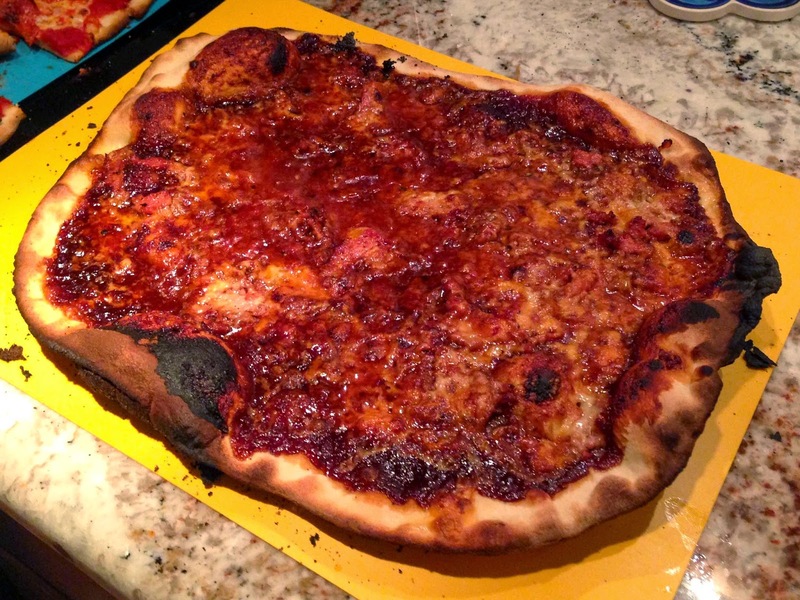 I've tried making pizza several times and I now realize the thing I was screwing up is that I was using the pizza stone as a prep place for the pizza, rather than getting letting the stone get hot first, and sliding it on. The pizza wasn't bad, but it typically stuck to the pizza stone. I would have thought using the peel would be tricky. 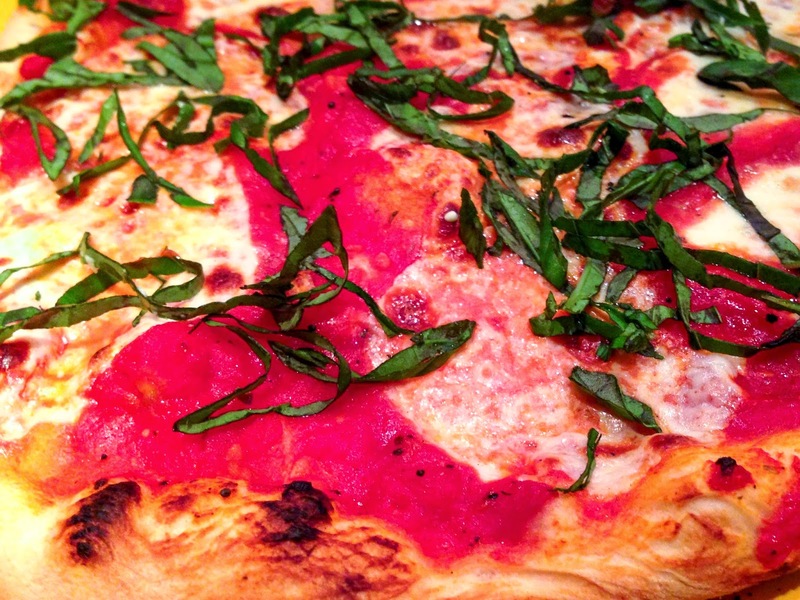 Doesn't it stick at all while you're trying to slide it onto the pizza stone? I use cornmeal on the stone and the peel to prevent sticking. The hot stone doesn't grab the dough because the dough starts cooking the moment it touches. It takes a bit of practice, but using the peel and hot stone is sooo much fun. It is hard to set up inflatable bounce house. If you rent our bounce house, we will set bounce house. Sit back, relax and watch as your inflatable Bounce House is set up right before your eyes!